This is the perfect choice for any little boy. 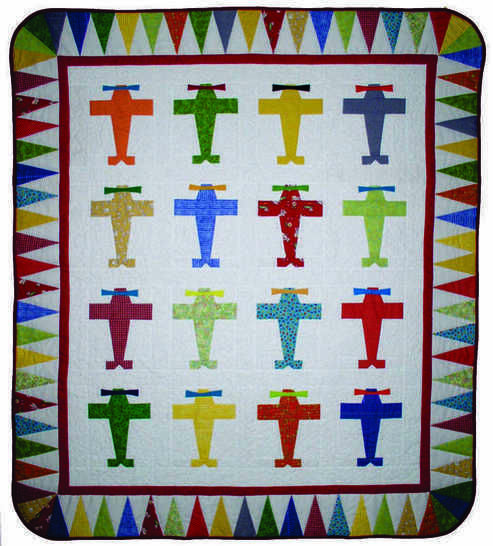 Airplanes in primary colors make it a winner with newborns and infants, but boys love airplanes, no matter what their age. This pattern includes foundation-piecing, applique template and complete instructions. It can be made from scraps, so it's a beautiful way to use some of your favorite leftovers. This pattern requires knowledge of paper piecing. Quilt measures 44"x52". Each airplane block measures 6"x8" finished.